The Chequered Skipper Carterocephalus palaemon inhabits a variety of habitats in NW Europe: heathlands, wet grasslands and chalk grasslands, usually at woodland edges and wide rides and glades in different types of woodlands. It mainly uses broadleaved grasses such as Molinia, Calamagrostis and Brachypodium as host plants. The species became extinct in England in 1976 and an earlier reintroduction attempt in 1995–1999 was unsuccessful. Using species distribution models, we located potential source regions in NW Europe for its reintroduction to England. To do so, we gathered distribution data of the butterfly and environmental variables (Corine Land Cover and climate data) from four regions in Belgium (Belgian Campine, Fagne–Famenne–Calestienne, Ardenne–Thiérache and Gaume–Lorraine), two in the Netherlands (Achterhoek and Dutch Campine) and one in the United Kingdom (Argyll, Scotland). We calibrated the models in these regions and projected them to the Rockingham Forest landscape, the reintroduction site in England. The Fagne–Famenne–Calestienne and the Gaume–Lorraine model resulted in the highest average probability when projected to the Rockingham Forest landscape. 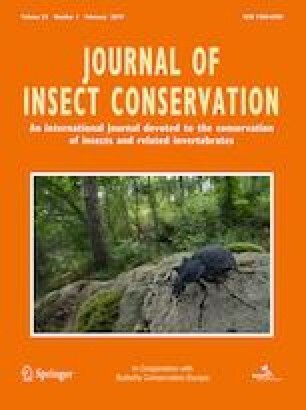 Based on additional expert knowledge on potential host plant abundance and the presence of large source populations, the Fagne–Famenne–Calestienne was selected as the source region for the reintroduction of the Chequered Skipper to England. To assess the possible impact of climate change, we also built a model with present-day climate data in NW Europe and modelled the probability of occurrence in the Rockingham Forest landscape in the year 2070. The species was predicted to increase in the Rockingham Forest landscape under future climate conditions. The online version of this article ( https://doi.org/10.1007/s10841-019-00154-w) contains supplementary material, which is available to authorized users. Jeroen De Reu, Jo Loos, Toon Van Daele and Hans Van Calster are kindly thanked for their help with data handling and for statistical advice. Data from Wallonia were kindly made available by the Groupe de Travail Lycaena and by Gilles Maldague (Département de l’Etude du Milieu Naturel et Agricole—DEMNA). We thank Pieter Vantieghem and Thomas Merckx (Vlinderwerkgroep Natuurpunt), Camille Turlure and Aurélien Kaiser (Université catholique de Louvain), Camille Van Eupen (Katholieke Universiteit Leuven), Jamie Wildman (Butterfly Conservation UK) and Jenny Jaffe (Zoological Society London) for their help during the field work. We also thank Jorge Léon-Cortés and an anonymous reviewer for their critical comments on the manuscript. All procedures performed involving animals were in accordance with the ethical standards of the Disease Risk Management and Post-Release Health Surveillance.